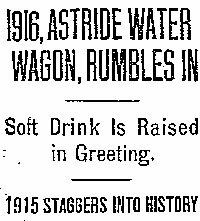 Oregonians’ hangovers were especially harrowing on January 1st, 1916. On that day the Anderson Act, passed by Oregon’s Legislative Assembly, took effect. The sale and consumption of alcohol was prohibited. Oregon drinkers had a glimmer of hope in November of 1916, but they couldn’t muster enough votes to pass an amendment allowing the sale of beer. Oregon was “progressive” back then in the wrong way, entering this dark era of history three years earlier than the country as a whole. Fortunately Oregonians know better these days.